The BMW smart assistant, which responds to the prompt "Hey, BMW," uses natural language understanding to help drivers and passengers intuitively interact with the vehicle. As vehicles morph into computers on wheels, the way people interact with them is changing. Dashboard buttons and knobs are being replaced by high-definition, artificial intelligence-powered supercomputers. On Thursday, BMW introduced Intelligent Personal Assistant, an AI-powered system to help drivers communicate with their cars as they do with their smartphones. The always-on-call technology platform, expected to roll out next year, is an intelligent, digital character that can control vehicle settings, navigation and entertainment systems. Rival Mercedes-Benz is debuting a similar AI-based assistant technology in its next-gen multimedia system. Mercedes-Benz User Experience, or MBUX will appear in the new A-class sedan this year. Value creation in the auto industry is shifting from the powertrain to digital experiences in the car, Dieter May, BMW Group's senior vice president of digital products, told Automotive News. "With automated driving, this will accelerate because you have a lot of captive time in the car," May said. "The interior of a car will totally change, and digital can provide great experiences there to differentiate the car versus competitors." In-vehicle concierge services save time and make the driving experience more convenient, said Brian Moody, analyst at Autotrader. "Today, the real luxury in life is time and convenience," Moody said. 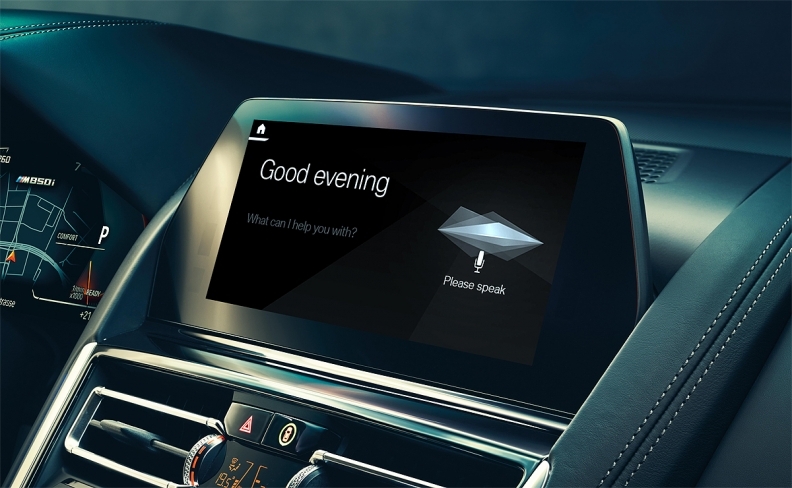 Advanced voice-recognition systems, cloud computing, AI technology and faster computing have made robust and full-featured infotainment systems possible. "We are not talking here about voice commands like you know from the past," May said. "It's building a digital character which you can interact with. The digital character ... grows the more you use the car, the more you interact with BMW." The smart assistant learns driver setting preferences and can make a series of adjustments automatically based on nonspecific requests. For instance, saying, 'Hey, BMW, I feel tired" adjusts ambient lighting, music and temperature to keep the driver alert. Saying, "Hey, BMW, I'm cold" prompts the assistant to turn up the heat. The technology serves as a productivity tool -- predicting travel routes based on time of day; syncing with appointment calendars to offer directions to the next meeting; and integrating with Microsoft Office 365 to read emails. The assistant doubles as a voice-activated manual, educating drivers about vehicle features and functionality. "In most premium cars, you have so many functionalities that customers don't know what they have available," May said. Over time, the assistant will offer fuel-saving driving tips; deliver alerts, such as low tire pressure warnings; send service appointment reminders and even schedule the service. The Intelligent Personal Assistant will be offered for models featuring the new BMW iDrive 7.0 and as part of the Live Cockpit Professional. Technology is fueling auto sales, especially among younger consumers. Half, or more, of drivers are willing to sacrifice on vehicle color, style and brand to get the latest technology, while a third would even sacrifice safety, according to a 2017 survey by Cox Automotive. It's no longer about features on a spec sheet, Autotrader's Moody said. "The real differentiator is about the experience; it's about saving time; it's about convenience," he said. Developing infotainment platforms in-house, rather than relying solely on third-party services such as Apple CarPlay and Android Auto, gives automakers better control of the product development cycle and allows for deeper integration with the vehicle. It also provides crucial user data that automakers wouldn't have access to with third-party systems. Understanding what people are doing in the vehicle provides automakers opportunities to create revenue streams and improve the user experience, said Sam Abuelsamid, senior analyst with Navigant Research. Smart infotainment systems are revenue streams for automakers, creating a marketplace for third-party apps and services that, for instance, allow drivers to find parking or pay for a gas fill-up. "Whoever owns the platform can skim a percentage off the top," Abuelsamid said. "Those nickel and dimes eventually add up to real money."